After eliminating three opponents in a row, Kim Jiseok of South Korea finally had to surround to Xie He of China. The game record is here. Xie He (white) won by resignation. Complete tournament table is here. 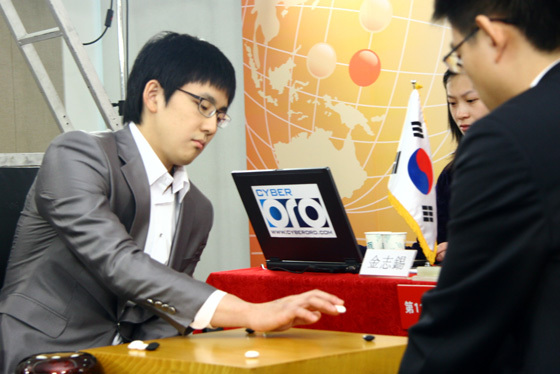 Kim Jiseok of South Korea eliminated three opponents in a row in the 11th Nongshim Cup after defeating Takao Shinji 9p of Japan. He will be matched next with one of the remaining Chinese players the day after tomorrow, in the last day of the first stage of Nongshim Cup. Kim Jiseok (white) won by half a point. 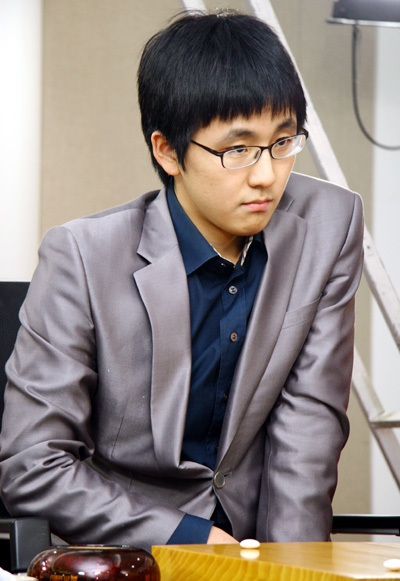 In the 11th Nongshim Cup Kim Jiseok of South Korea eliminated Ding Wei 9p of China. He will play next against Takao Shinji of Japan. The game record is here. Kim Jiseok (white) won by resignation. Cho U defeated challenger Yamada Kimio with 3 straight wins and kept his Oza title for another year. The 3rd game record is here. Cho U (white) won by 3.5 points. 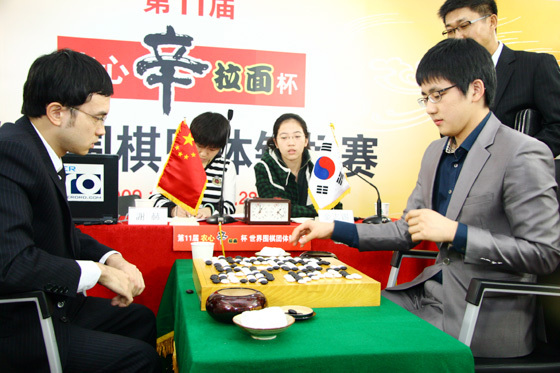 The 11th Nongshim Cup started with Kim Jiseok 6p of S. Korea eliminating Yamashita Keigo 9p (and Kisei title holder) of Japan. Next game will be played tomorrow (or tonight in the US) with Kim Jiseok being matched against one of the Chinese players. Cho U, Oza title holder, won the second game as well against challenger Yamada Kimio. Cho U is just one win away from keeping this title for another year. The game record is here. Cho U (black) won by resignation. The next game will be played on November 26th. Complete tournament table is here. 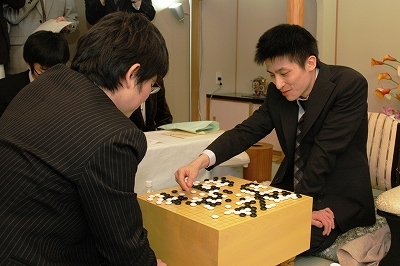 Cho U, Tengen title holder, defeated the challenger Yamashita Keigo in the second game. The game record is here. Cho U, playing black, won by resignation. Next game will be played on December 3rd. Cho U defeated O Rissei in the playoff to decide the Kisei challenger. The Kisei title holder is Yamashita Keigo, who is currently challenging Cho U in Tengen title. 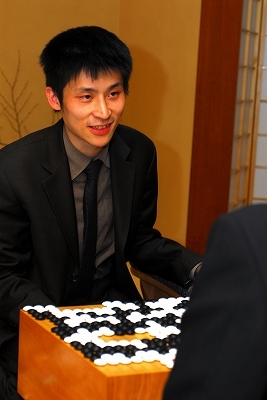 Yamashita Keigo, challenger for this year Tengen title, won game one against title-holder Cho U. Here is the game record. Cho U (white) resigned after black’s 281 move. Cho U has captured the Tengen title from Kono Rin last year, after Yamashita Keigo has unsuccessfully challenged Kono Rin for two years in a row. 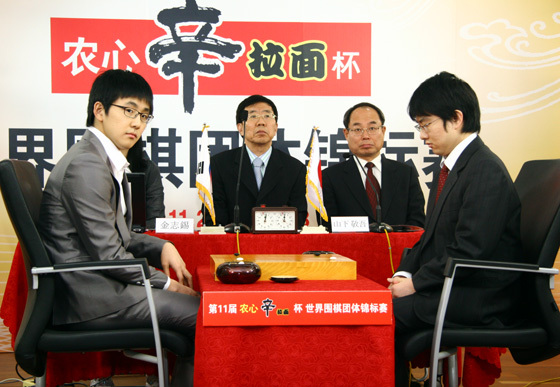 The computer-Go system Mogo won for the first time against a top professional player (Zhou Junxun 9p, winner of international LG Cup in 2007) in an even game on a small, 9×9 board. Game record below. Mogo played black and gave 7.5 points komi. You can read the full report on the blog of Olivier Teytaud, one of Mogo’s creators. You are currently browsing the 361points.com/blog blog archives for November, 2009.